Left: Baku's Sports and Exhibition Center provided the arena for 50 international athletes to compete in the World Cup this past August. 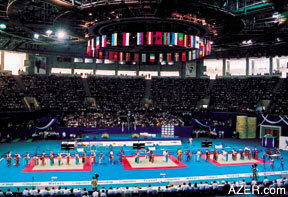 On August 9-10, Baku hosted the 2003 World Cup for Rhythmic Gymnastics. This was the second of three stages to determine the World Champion, the first stage having been held in France earlier this year. It was the first time the World Cup for Rhythmic Gymnastics had ever been hosted by Azerbaijan. The venue took place at the Sports and Exhibition Center which seats 7,000 spectators. Lider TV provided live coverage of the event. More than 50 sportswomen from 19 countries participated. Although Azerbaijan athletes have participated in these World Cup competitions in the past, this was the first time they have won any medals. Dinara Gimatova (pronounced gee-MAH-to-va) received one Silver and two Bronze medals. She will go on to represent Azerbaijan in the final championship later this year. Alina Kabayeva, a Russian, won First Place. Rhythmic Gymnastics, an Olympic sport, has become quite popular in Europe and the United States. The competitions include four categories, depending on the equipment used in the athlete's routine - ribbon, club, hoop or ball. Above: (Left) Azerbaijani Dinara Gimatova competes in the World Cup Rhythmic Gymnastics that were held in Baku in August. She took Third Place. Right: World Cup Rhythmic Gymnastics (2nd stage for 2003): 1st place: Alina Kabayeva, Russia; 2nd place: Irina Chashina, Russia; 3rd place (far right) Dinara Gimatova, Azerbaijan. This event was organized together with the Ministry of Youth, Sports and Tourism, National Olympic Committee and the Gymnastics Federation of Azerbaijan. Plans are being made for the 2005 World Cup Finals for Rhythmic Gymnastics to be hosted in Azerbaijan. Gulnar Aydamirova interviewed Ragif Abbasov, Press Secretary of the Minister of Youth, Sports and Tourism for this article.